Many of you know the young lady who was featured on the homepage of our website last year, but some of you have no idea who she is. She is Gaby Guerrero, the daughter of Race Committee Member and Loyola Marymount Cross Country and Track Coach Scott Guerrero and Alison Guerrero. While people assumed Scott was responsible for engineering her to be our cover girl, he had nothing to do with it. We were hoping to appeal to a shrinking demographic in our race and races across the country and Gaby fit the bill to represent the Manhattan Beach 10K. First off, we’d like to congratulate you as you start your college career as an LMU Lion! Tell us how you made the choice to attend Loyola Marymount. Thank you! LMU checked all of my boxes. I wanted to be near the beach, at a Catholic school, and to run collegiately! I also fell in love with the LMU mission statement of the encouragement of learning, education of the whole person, and service of faith and promotion of justice. How do you feel about having your dad coach you? I am ecstatic to have my dad as my coach these next four years. He is incredibly straightforward in terms of why we train the way we do and is firmly invested in helping every single person on the team become the best runner they can be. I also think my dad’s calm temperament and sense of humor make him wonderful to be around as both a coach and a dad! He has always been so supportive of my running and education and this is just going to be an even better version of that. You are a 3rd generation committee member for the MB10K and you’ve announced awards at the last 2 races. What is your motivation for being so involved in the race? Two things I love more than anything are my hometown and running, so the 10K has always been something to be involved in which combines those two passions. I can remember being 6 years old and sitting on the floor of John Post’s gallery while my mom and him discussed shirt designs, so being involved is definitely in my blood! The last 4 years of my involvement have also been influenced by my running it as a workout with MCXC and volunteering on cleanup with the MBMS choirs. You were our cover girl for the MB10K website last year. How did you feel about being the face of the race? I think that's a better question to ask my teammates because they thought it was hilarious. Running isn't pretty but I liked that you could see how hard I was working those last 200m. In that cover image you wore a tee that said “Run Like A Girl”. What does that mean to you? Run like a girl is one of my favorite phrases because I think female running is so unique and special. As girls, running for us is an outlet where we can be gritty and competitive without worrying about being “nice” or “pretty” like society often pressures girls to be. Running is a unique sport that allows us as girls to bond by pushing each other on the hard days and having meaningful conversations on the easy ones. When I run like a girl it means to me that I channel the spirit of toughness I've learned exists in all of the female distance runners I've ever known, whether it be teammates, coaches, or competitors. How many MB10K races have you run? I think I started running the 10K when I was 8, which would mean I have run 9 races! Have you ever been part of a family team? Within the race? I think my dad and I have gone after the father / daughter category, but somehow we always get beat out by a member of the Chittenden family. Will you be able to run the race this year? Sadly I will not be able to run this year as I will be in full swing of cross country season. However I am hoping to bring out my British roommate to cheer runners on and of course hit the fair afterward! Do you see yourself taking on bigger roles on the committee in the future? I hope that over the next couple of years I am able to find time in my schedule at LMU to help out with the race that has given me so much. I loved announcing the awards so perhaps I'll be able to do that this year, but mainly I just want to help in any way I'm able! I think I’d have to say the thing I love most about the 10K is the memories it has given me, which are innumerable. When the finisher shirts would arrive at my house and my mom would have me help her sort them in our living room. When I used to run the race with my dad as a kid he would give me tips the whole time about walking up hills and how to pass people at the end. The first time I ever saw now long time boyfriend was a photo of him post 10K in a finisher shirt. And of course running the race with my MCXC teammates, absolutely exhausting ourselves in the morning and changing and heading straight to the fair in the afternoon! 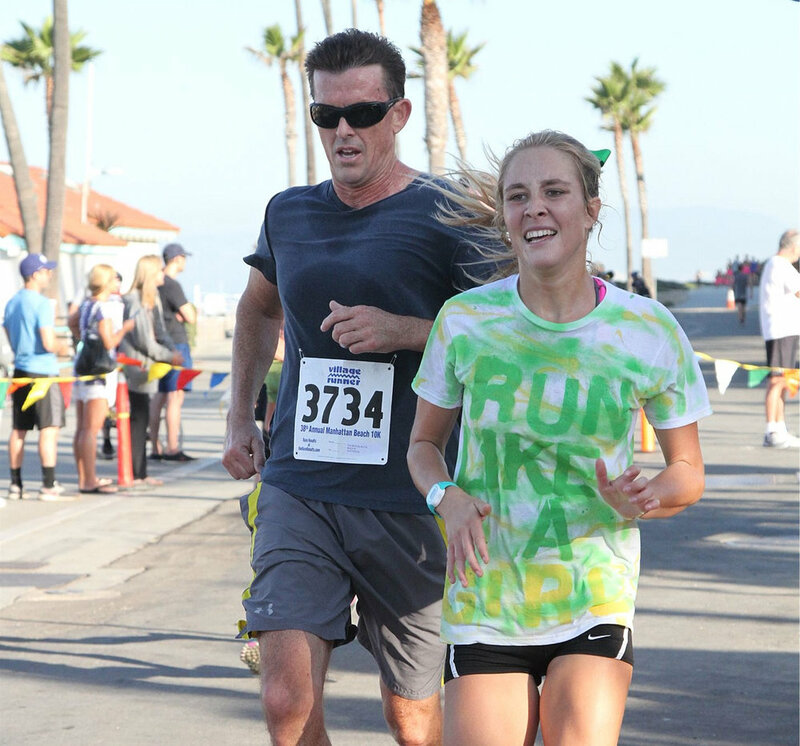 The 10K is my favorite event that Manhattan Beach has to offer and I hope that every year more people get to experience the joy it has brought me. We will have a booth at the Manhattan Beach Farmer’s Market on Tuesday, September 12, 2017! Stay tuned for fun and surprises happening there!